Alexa Traffic Rank Explained. What You Should Know About It? Have you heard people bragging about their online success based on their Alexa rank? There is a lot of hype surrounding Alexa rating and many believe that if you can make your website in the top 100,000 in Alexa, your site gets heavy traffic, and you are successful. So what is considered a good Alexa Rating? Is it worth to invest your time and energy to improve it? In this blog post, the Alexa Traffic Rank is explained to help you decide whether or not it is beneficial to your online campaign. Alexa Ranking has been set up by alexa.com (a subsidiary of amazon.com) and should roughly tell you how popular a website is. It takes account the number of site visitors and the number of pages that are viewed on each visit. It is supposed that the lower the ranking number, the higher the site ranking. There are some restrictions too, though. For example, Alexa makes clear that if you visit the same URL many times on the same day, Alexa counts all your visits as one. At the Alexa website, you find several metrics. These include Alexa Traffic Rank, Traffic Rank in the local country, Engagement metrics, Audience Demographics and geography, top keywords, search traffic, total sites linking in, etc. All these are supposed to give you a picture of your website history. Some of the metrics of Alexa ranking system. It looks great, but there is a serious problem. Alexa collects its data from those users ONLY who have the Alexa toolbar installed over a period of three months, and then makes its estimations. If you have the Alexa toolbar installed, each time you visit some web page, your data is sent to Alexa. Problem #1: Have you already installed the Alexa toolbar? How many people worldwide have installed it? 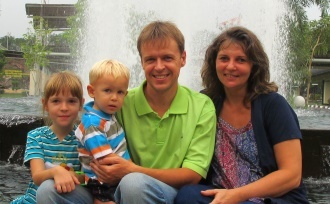 Mostly web developers, administrators and those who are interested in internet marketing. But an average internet user does not know anything about it. Think about it. If your site gets 1000 unique visitors per day and only 10% of them have installed Alexa toolbar then according to Alexa you have only 100 visitors each day. You see yourself, Alexa ranking is heavily skewed and considering website’s total traffic you cannot rely on it. 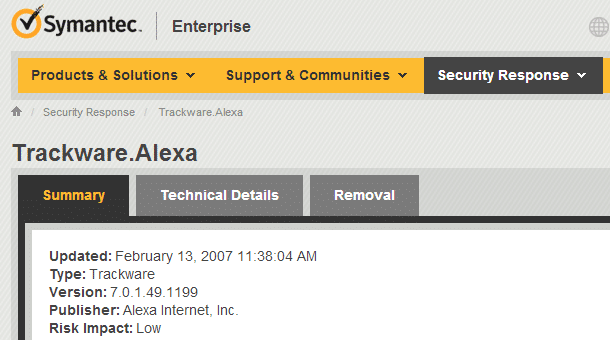 Symantec’s competitor McAfee considers Alexa as „adware.“ That is just exactly what the Alexa toolbar does – it tracks and records all of your website activities and sends the data to Alexa servers. A result of the much-hyped Alexa rank is that people are trying like crazy to improve it. Sometimes they succeed even by millions of places. Then, for no apparent reason, they lose the same millions of places, and they don’t know why. Their websites still sit on the first page of Google SERP. There are testimonies where people say that they have got their Alexa rating from 5 million down to 800,000+, yet their Google rank remained unchanged. Other people have tested Alexa ranking on their websites. Just to know how accurate it is. For their test, they took two websites, one with 20,000+ and the others with 1,000+ unique visitors per day. However, the inferior site with 1000+ UV per day was getting two times more traffic in Alexa reports than the first website with 20,000 UV per day. So how is the Alexa rank connected with the real traffic? Answer. It is not. Other weird things are happening with Alexa ranking. There are websites out there that got punished by Google’s Penguin update (2013) and get now less than ten visitors per day. However, their Alexa rankings stay consistently high. So how is this rank connected with the real traffic? Why do these anomalies happen? Because Alexa has NO access to real search data and its ranking has nothing to do with actual traffic nor ranking in Google. Ranking in Alexa and ranking in Google are two entirely different things. Higher ranking in Google means more real traffic to your website, but you cannot say the same about Alexa ranking. Higher traffic ranking in Alexa DOES NOT mean more traffic to your site. And lower Alexa ranking DOES NOT mean less traffic to your website. There are a few products which you can purchase on the Alexa site. It may look tempting but in fact, it’s complete nonsense that you have to pay them so that they could “spy” on you…? They should pay you for it. Alexa’s problem is that they have NO access to your data if you don’t give them permission. It does not make ANY sense to pay them so that they could “spy” on you. To analyze your traffic, use Google Analytics. It belongs to Google, and they have the real data that helps your business in a real way. Again, what’s the point of purchasing them, if you already have a FREE Google Analytics tool? In fact, a free Google Analytics is way superior to these Alexa Pro tools. The reason is the same – Google has the real traffic data and Alexa does not. 6. How to Check Alexa Rating? If you want to try out your Alexa website ranking, go to Alexa.com and type your URL into the box. Another way to check your Alexa ranking is to download Alexa toolbar and get your ranking from it. However, I don’t recommend doing it. 7. How does the Alexa Rank help you? Have you already checked your Alexa ranking? How does it help you? The number is not even accurate because Alexa has NO data to measure it accurately. Let me ask you – How does this information help you? The number is not even accurate because Alexa has NO data to measure it accurately. So what benefits you get from knowing your Alexa rank? None! Does it help your business in any way? No. None! Does it help your business in any way? No. Does it help your business in any way? No. What counts in real life is where your websites rank in Google. If you want to analyze your actual ranking, better use the Jaaxy Keyword Tool. Jaaxy scans Google search results and tells you where you are ranked under specific keywords. Try it out for free. It gives you a real picture. Jaaxy scans Google search results and tells you where you are ranked under specific keywords. Try it out for free. It gives you a real picture. 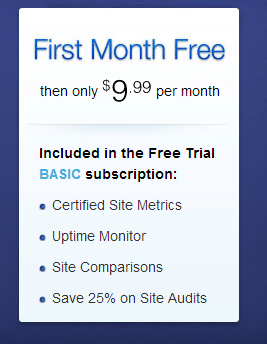 Create a free trial account, and then click the “Site Rank” button. Here you see fields: Keyword and URL. Type in your keyword and URL of your website then hit the red “Search” button. Jaaxy returns the page number and position on that page where your website locates in Google SERP. If Jaaxy returns the message: “Not found“, it means that your websites are sitting lower than page 20. Install the Alexa toolbar in your browser and then surf your site. Try to attract as many Internet-savvy visitors as possible to come to your website. It’s a just higher probability that they have installed the Alexa toolbar. Write webmaster-related quality content and promote it on webmaster forums, etc. That too attracts those folks to your website that have installed Alexa toolbar to their browser. Tell your friends to install the Alexa toolbar and then visit your site. It might look fantastic way to improve your Alexa ranking, but there is also a problem. If your site is mostly visited by those people who have installed Alexa toolbar, your ranking improves. However, if it is not the case and a major part of the visitors are without Alexa toolbar, then your ranking gets worse. In fact, your real traffic may increase while your Alexa rank is getting worse. You are left scratching head trying to figure out what’s wrong. 9. Is it Worth to Spend Time Improving Your Alexa Rank? You should not care about Alexa ranking because Alexa will never give you money. They provide you with incomplete and inaccurate data that you cannot rely on when improving your SEO. If you are in a business of making money from your website, Alexa does not help you in any way. Watching and improving its ranking is just a waste of your time. You don’t have unlimited time resources so you should be careful how you use your time. Focus on those things and metrics that count and don’t waste your time about Alexa ranking that has nothing to do with your website traffic or success of your site. 1. If you want to find out who visits your site, when and how long, you better work with Google Analytics. It tells you everything that you need to know about your traffic. 2. Use Google Webmaster Tools for your website and keyword performance. 3. 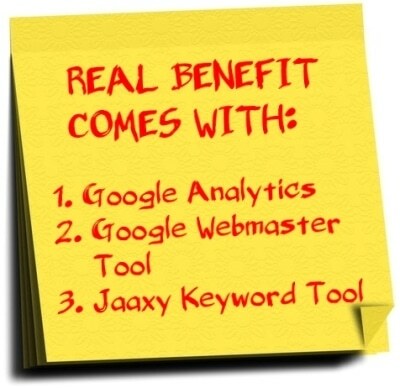 If you want to know how well your website (or page) ranks in Google, use Jaaxy Keyword tool. It gives you the site rank under specific keyword. It also provides you with quality, low competition keywords that help you rank your site higher. And this is what you want, isn’t it? Have you had experiences with Alexa rankings (whether good or bad) that you want to share here? Please drop a comment below.